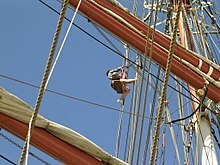 A bosun's chair, in use by a bosun, re-tarring a section of a backstay on the Prince William after making a minor repair. A bosun's chair (or boatswain's chair) is a device used to suspend a person from a rope to perform work aloft. Originally just a short plank or swath of heavy canvas, many modern bosun's chairs incorporate safety devices similar to those found in rock climbing harnesses such as safety clips and additional lines. In addition to the maritime applications they were developed for, bosun's chairs are also used for working at height in various maintenance industries. In commercial window cleaning, the term bosun's chair describes devices suspended from rope and equipped with seatboards, such as descent-only controlled descent apparatuses (CDAs). Bosun's Chair has become a competition event in Sea Scout Regattas in the United States such as the Old Salt's Regatta and the Ancient Mariner's Regatta. ^ "History of the Bosun's Chair". Nick's Window Cleaning. Retrieved 18 November 2017. This page was last edited on 22 October 2018, at 18:02 (UTC).